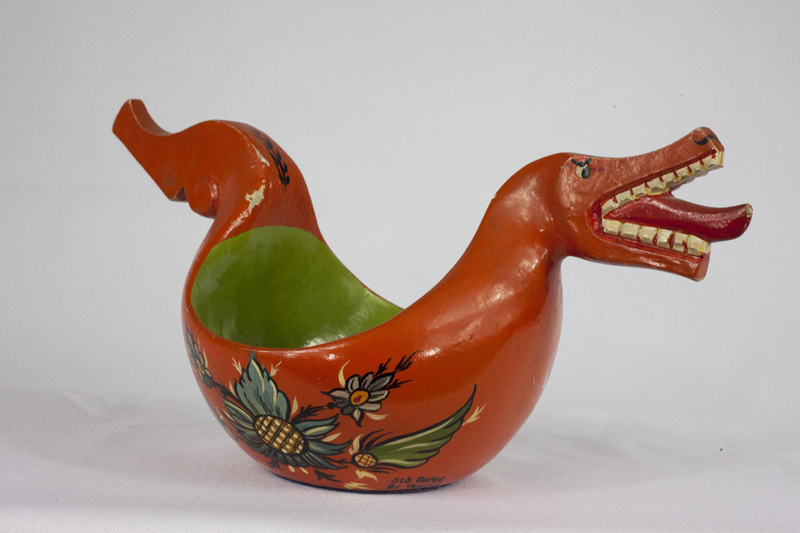 Ale bowls come in many forms, but in the twentieth century those carved with dragon heads became especially popular on the souvenir market. Buyers were attracted to the form’s resemblance to the famous dragon-prowed longships of the Vikings. Norwegian immigrant, Trygve Thoreson, Sr., utilized Norwegian identity as a marketing tool when he named this bowl “Old Norse.” Decades before Mount Horeb branded itself “the Troll Capital of the World,” Thoreson decorated his home with rosemaling, named it “the Norway House,” and made it into a business providing food and lodging to tourists.